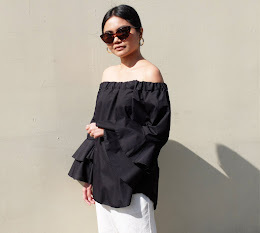 While I was surfing the internet 3 summers ago, I chanced upon Agathe's amazing blog, Stylebytes. I could just remember how excited, elated and overwhelmed I was as I read each of her blogposts. Agathe had the BEST outfits, shopping experiences, accessories, vintage finds and DIY projects. I would look forward for her daily updates to get inspiration. Through her, I learned how to think out of the box when styling outfits. All her vintage clothes and accessories influenced me to go out and discover the best vintage stores in my city. I am immensely thankful for that fateful summer day of 2007 when I found Stylebytes and realized how much I love fashion. I looked at fashion differently this time. I used to think that it was just about wearing clothes, being simple and blending in. But after seeing all Agathe's fashion-forward photos, looking like everyone else was immediately out of my vocabulary. PS. I am inlove with Miss East's top. It reminds me of Pucci. Bossini shirt, random black skinny jeans, black sling bag, Miss East's Charles and Keith studded shoes. The sling bag is gorgeous! I've been meaning to find something similar, although tan lang ang color bagay for me hihih. I saw something at SOPHIE but I'm not sure if the whole long-strap-bag thing is me because I'm short :( Hahhayyy. Somebody hand me height! Hahah! i just looooooooooove the last photo! !